Klein argues that climate change is the result of unrestrained capitalism putting short-term profit above all else, even the laws of physics. In this accessible gripping account, she gives the big picture needed to understand that climate change is human-caused. A psychological and psychosocial perspective is also needed to engage with climate change. 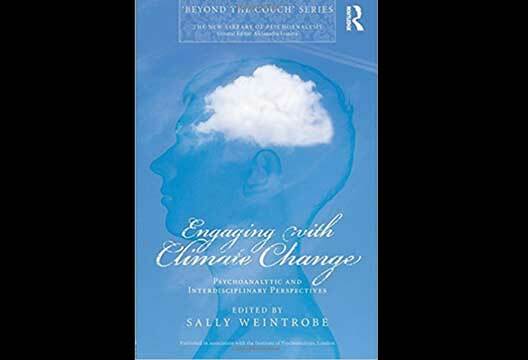 In this ‘jargon-lite’ book, structured as an interdisciplinary dialogue, the authors (many of them psychoanalysts and psychotherapists) discuss questions such as, Why are we collectively in such disavowal about the seriousness of climate change? The book argues the disavowal is predominantly culturally driven. This gem of a book also helps join dots between the psychology, politics and social forces. It offers simple practical ways to reduce one’s carbon footprint, gives clear charts that show how much carbon is involved with daily actions and products and – I found this very useful – offers guidance on what to choose among ‘least worst’ alternatives. A compact ‘calorie counter’ type of book that opens one’s eyes to the problem of carbon and why we need to move to a cleaner smarter world. Sowing doubt and confusion about science is a deep attack on our caring part and deeply demoralising. It leads to progressive breakdown of trust in scientists and the reality-based community in general. This book shows how large corporations funded the denialism of climate science. Highly relevant for traversing today’s world of ‘alternative facts’. So, I suggest, is Orwell’s classic novel, now back on the bestseller list after Trump’s election. Orwell’s subject is how politics uses culture to influence us psychologically to go along with a particular regime. My recent work is on how current culture serves the aims of neoliberalism: it boosts our self-idealising wish-fulfilling part to encourage us to ignore reality and continue with carbon-intensive business as usual. - By Sally Weintrobe, Fellow of the British Psychoanalytical Society and Chartered Psychologist. Sally is also a climate psychologist and is currently working on a new book The Anti-mind: How Present Culture Undermines Our Sense of Reality, which explores ways mainstream culture actively seeks to block transition to a low-carbon fairer economy. A Founder Member of www.climatepsychologyalliance.org, her talks and blogs can be found on www.sallyweintrobe.com.